Yesterday, Mr J and I had those feelings like it was our first day at school. It had been in my diary for weeks. Squeaks has been coming home for the last few weeks with new songs in her repertoire. As the weeks have gone on the words have been clearer and the songs longer. At the weekend we 'caught' her in the lounge, with the boys sitting on cushions on the floor. She was stood in front of them announcing "Ladies and Gentleman, welcome to our play." Grandparents were able to attend the dress rehearsal on Monday, and today was our turn. I can't explain how wonderful it was. The intense concentration on everyone's faces. The excitement as the little ones looked in and desperately tried to spot their parents faces, and the joy as they spotted the familiar face, and a little bit of them (and of us) relaxed. Now, I know these teachers are completely experienced in this annual activity. But wow! 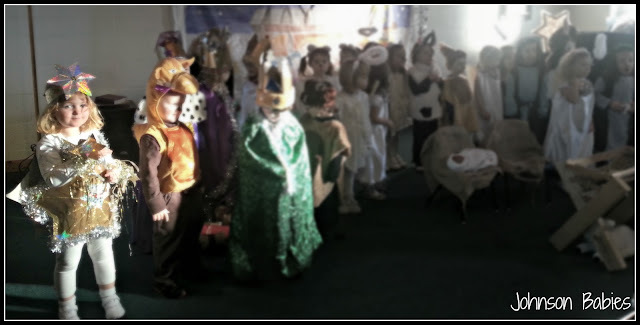 To keep a class of 30 in check, to give everyone a key role, to get thirty children to learn the words, music and movements to a number of songs creating all the outfits, the list goes on. And then, to come out the other side smiling- wow! Squeaks had the part of her namesake, and alongside another little girl, they got to lead the class in a rendition on 'Twinkle, Twinkle'. And of course, my heart soared. The happiness was palpable. My little girl, like every other child, was amazing!